The new Australian immigration laws have charted out in more favorable conditions for potential migrants who are wither single or have highly skilled spouses. According to the rules put forward, an applicant’s application can be impacted if their partner is not skilled or highly educated. The new laws are set to come into force by November, 2019. According to the Migration Amendment (New Skilled Regional Visas) Regulations 2019, three kinds of new visas, which also include the regional ones, have been introduced in a bid for the Australian government to increase the settlement of migrants to regional areas of Australia to develop them economically and financially. Increased points for those having a skilled spouse or de facto partner, they will be awarded 10 points. More points for those applicants who have been nominated by a state or territory government or have been sponsored by a family member residing in regional Australia, they will be awarded 5 points. More points for having certain STEM qualifications, they will get 10 points. Points for applicants who do not have a spouse (single applicants) or de facto partner, 10 points will be awarded. Points for those applicants who have a spouse or de facto partner who have component set of English language skills, 5 points will be awarded to them. It can be evidently witnessed from these point scoring amendments and grids that more preference will be given to those candidates who are either single or have a skilled professional spouse or de facto partner. 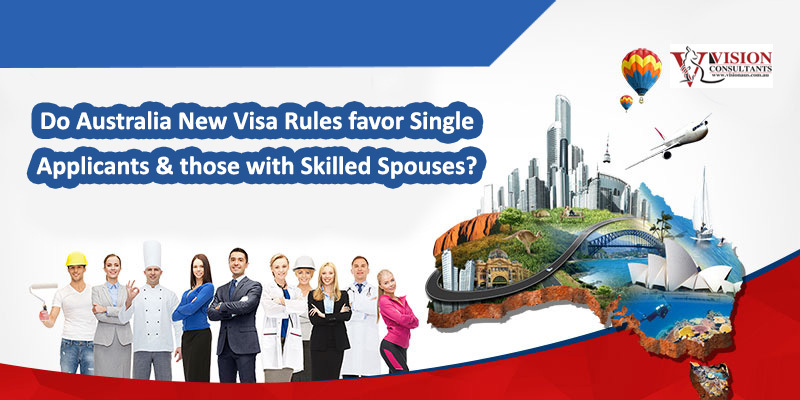 The applicants with a spouse who have not sufficient skills or English language expertise may have to look for other ways to increase their points. In order to further gain assistance regarding this new visa type and if you want free one-on-one consultations, Vision Consultants Australia (best education agents in Melbourne, best migration agents in Melbourne) can provide expert education and migration consultancy and visa services. Unparalleled service standards have given us an industry feat of best education agent and migration agent in Australia. Our team of MARA registered agents is always there to guide you.